A building that showed great results in August is 64 Northbourne Avenue, Canberra. An active facilities management team has worked together with Buildings Alive, BMS and mechanical contractors to identify and act on controls issues that were causing the building’s performance to slip. The Buildings Alive REF messages show the difference before and after the FM team identified and rectified the issues. The Buildings Alive daily REF messages showed that 64 Northbourne Ave’s performance had started deteriorating. The new facilities management team investigated some suspicious points on the BMS, identified during one of Buildings Alive site visits, and found there were several control issues and tuning opportunities available in the BMS. Seasonal temperature set points and zone temperature dead bands: Introduced seasonal temperature setpoints for the building. Additionally, cooling and heating dead-bands were widened. 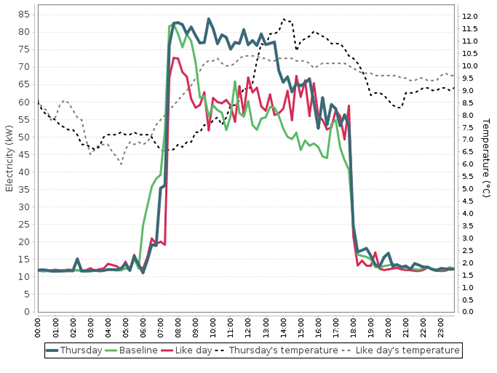 Temperature and Pressure sensor calibration: Recalibrated erroneous temperature and pressure sensors that were causing the AHUs to run at 100% load. Improvements to cooling call: VAVs that were stuck in maximum cooling mode have been released from manual override to prevent overcooling. Optimal start- and stop-times: The FM fine-tuned the start and stop times based on building demands and seasonal conditions. 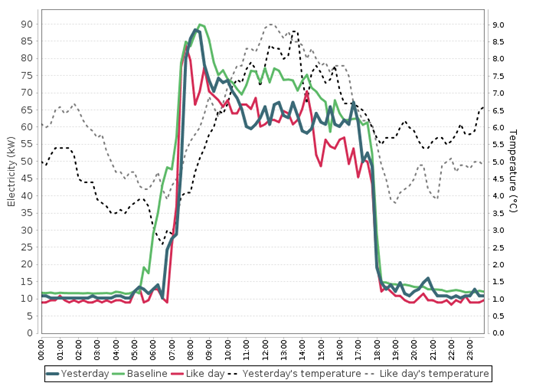 Optimised boiler controls to minimise heating and cooling conflict: The new condensing boiler was prioritised in code as lead boiler, and lockouts were implemented to avoid overheating and simultaneous heating and cooling. BMS maintenance: The BMS maintenance contract was split from the mechanical contract, to promote communication clarity. The efforts to get the building back on track had great results, and on the 5th of September 2017, the building has used 14% less energy than REF’s baseline, as shown in the REF message below. By comparing April-September 2016 to April-September 2017, the building used 21% less electricity (weather normalised), equivalent to 22MWh and a reduction in greenhouse gas emissions of 18 tonnes CO2-eq.